When liquid colours are used for plastics colouring, disposing of containers and residual colours causes extra work and additional costs, with negative effects on the life cycle assessment. 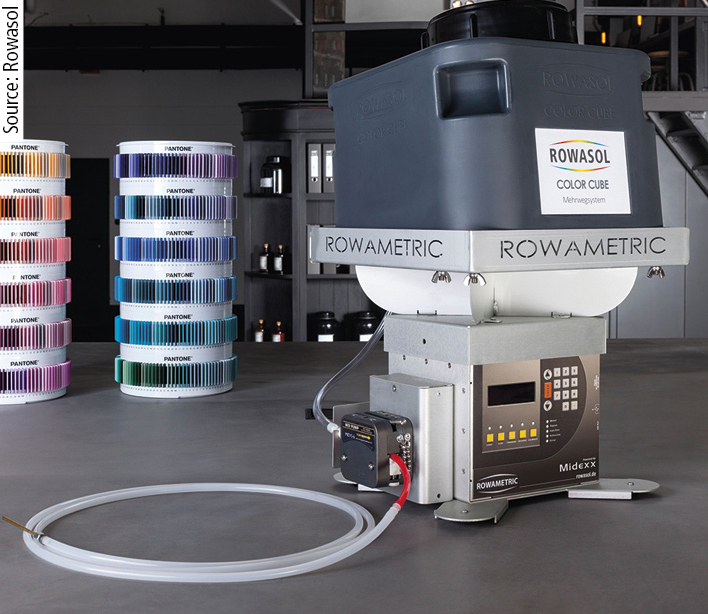 In order to remedy this situation Rowasol is now offering its proprietary Color Cube multi-use system. This is a roto-muolded, sturdy container of HDPE with a capacity of around 22 l. It is perfectly matched to the Rotametric dosing concept, but can also be used with a variety of other pump systems. The Color Cube can be coupled with a gravimetric peristaltic pump. According to the company, the special design allows for stacking Color Cubes – enabling space-saving storage and the dispatch of up to 18 containers in a transport box in pallet format. After use the Color Cubes are to be returned to Rowasol where they are refilled and shipped to the customer again. The cubes do not have to be washed out. The residues of color remaining in the container are homogeneously mixed with the new color during refilling. The customer only has to pay for the quantity of colour he actually consumes. The closed system with a quick-lock coupling at the outlet and the diaphragm venting valve ensures clean and easy handling of liquid colours without any risk of contamination. The Color Cube is available for a number of standard colours on request.